HA NOI (VNS) — A free mobile playground will be provided to children in the old quarter of Ha Noi on Saturday evenings from today (17 April) till June 27. 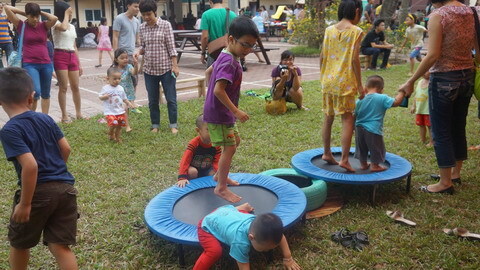 The project is an initiative of the Think Playgrounds group, and is supported by the management board of the Ha Noi Old Quarter and Health Bridge. The project, entitled Play Street, continues the previous activities of Think Playgrounds and partners to create free playgrounds for children in Ha Noi, and give them space to play with proper meaning. The playground of the Play Street project will be located on Dao Duy Tu Street, (the section between Luong Ngoc Quyen Street and Hang Buom Street). The first session will be held on Friday evening (from 8pm to 10pm). It will be organised every weekend evening (from 7pm to 9pm) till the end of June. All equipment of this mobile playground is expected to be handed over to the community or set up in some fixed playgrounds in the locality.